Abercrombie(ANF) shares are up 7.5% today on the heels of positive broker comments. After Barrons Online trashed the stock last week, upgrades by Credit Suisse and Goldman Sachs are boosting shares today. Barrons had pointed out that ANF shares are expensive, trading at 38times this year's earnings estimates and 21 times next year. They neglected to point out that shares are trading at a little over ten times last year's earnings, and just 7times what they earned in 2007. -->> Credit Suisse took their rating to Outperform from Neutral, and their price target to $49 from $30, which would be 30% upside from the current stock price of $37.65. They anticipate upside earnings surprises in coming quarters. -->> Goldman Sachs added ANF shares to their "Conviction Buy List" - basically the stocks they promote most heavily to clients. 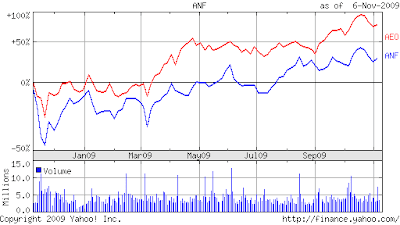 ANF shares traded as low as $32.50 last week after yet another weak Same-Store-Sales number came in. Debate has raged during this recession over ANF's strategy to "protect the brand" -->> as in, forgo sales instead of drop prices. People (myself included) worry that Abercrombie may be underestimating how important "brand" is, and that maybe they'de be ok becoming at least slightly more promotional. Lower-priced rivals have outperformed ANF handily over the past year, but Abercrombie is betting that their cache will lure customers back once the economy improves. As for valuation, it's all dependant on the time period. 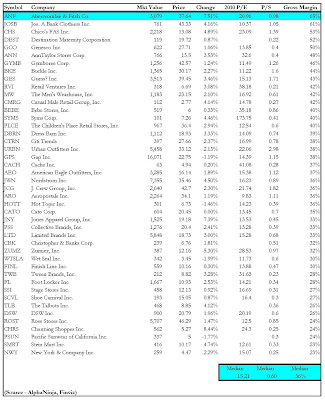 Barrons was right - 38times earnings is wickedly expensive. But investors will value this name on a "blend," if you will, of peak/probable/past earnings. And that's a delicate balance. A 15 P/E on past peak earnings gets you to a $78 stock, double the current price. A 15 P/E on $3.50 gets one to $52 per share, wight in line with today's new price targets. Note that $3.50 is FAR above next year's expected 1.66 in earnings per share. With all the fluctuations in the "E" in Price to Earnings, I'd look at the Price-to-Sales. Sales down move around nearly as much as earnings do. 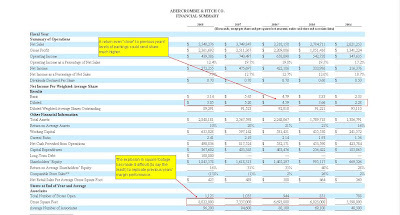 Abercrombie's P/S ration is about .98 versus the category average of .6 -->> but they lead the category with 65% gross margins. While they have the highest gross margins, they don't have anywhere near the highest Price-to-Sales ratio, which is held by Urban Outfitters(URBN). Even Chicos' (CHS) has a higher P/S. I think the debate will go on regarding Abercrombie's "brand value." The company's margins suffered as they (like others in the space) rapidly added stores and square feet. But shares could see big upside with a move back towards previous margins, and an easy double if they can get pack to all time high margins.